Discover the magic of Buenos Aires, the Paris of South America on this wonderful singles vacation. Throughout its troubled yet flamboyant history, Buenos Aires has exuded a romantic allure that has proved difficult to resist. Experience the Porteños' (the people of Buenos Aires) devotion to the passionate music of tango, the rich and varied cuisine and a wealth of art and culture. Celebrate New Years in Buenos Aires, visit the Gaucho countryside, cruise the Tigre Delta and travel to the country of Uruguay, all on this unique South America trip. Upon arrival in Beunos Aires you will be met at the airport and transfered to our centrally located hotel, the Kenton Palace Hotel. Free time to relax before we start our trip around this wonderful city. Tonight meet your group leader and join the other singles for an optional dinner. Today we explore Buenos Aires on our full Day tour of the city. Soaked in culture, the city is a giant living, breathing museum showcasing a vibrant, and often volatile, blend of European and Latin American influences. Learn about Eva Perón, one of the city's most famous inhabitants. Visit San Telmo, a traditional neighborhood where Tango performances can be seen in the bars and restaurants. A photo-stop is a must at La Boca, a very colorful neighborhood, which was the seat of immigrants - mainly Italians - and now home to local artists. Enjoy Palermo, an area that combines its architecture and history with entertainment and amusement in its green spaces. Finally, La Recoleta, an exclusive and elegant neighborhood where the famous Evita cemetery is found. 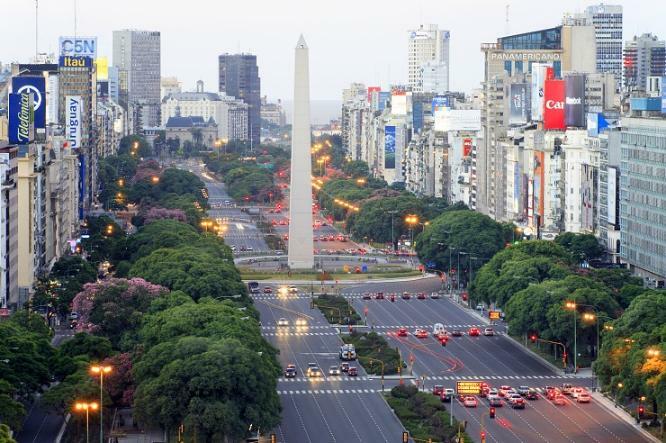 See the symbol of Buenos Aires: the obelisk. 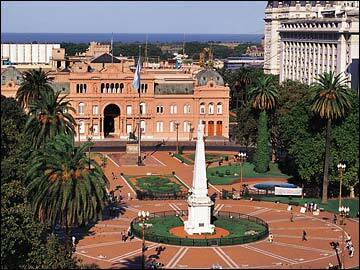 Visit multiple squares such as Plaza de Mayo, Plaza San Martín, and Plaza Congreso. Pass through avenues such as Corrientes, Mayo and 9 de Julio among others. Buenos Aires is known for its open-air markets (mercados) which combine shopping with entertainment. Today we will walk and shop the Feria de San Telmo, one of the most notable and popular markets that is nestled in one of the oldest neighborhoods. The San Telmo Fair is bustling with unique artisans and antiques, greatest qualities, besides the architecturally beautiful neighborhood which it calls home, are its exclusive goods and reliable nature. Never a Sunday will there be without tourists pouring into the cobblestone streets of San Telmo for one of a kind antiques, trinkets, art, tango and delicious food. Remember to take your eyes off of the endless maze of booths and gaze upward, the architecture of San Telmo is spectacular and a relic all on its own. San Telmo boasts extremely beautiful buildings that stand as they were, when they were built over a hundred years ago. In fact, we will visit an 1830 old mansion with an ancient Zanjón (ravine) to take a fascinating underground trip into the origins of the city. Today we leave Buenos Aires to explore the Tigre Delta, one of the largest deltas in the world. The Tigre Delta is a unique suburb built around the swampy land and meandering waterways that empty from the Rio Paraná into the Rio de la Plata. Former Argentine president Domingo Sarmiento encouraged settlement in the area during the mid-1800s and lived there himself for nearly three decades. First we will stop at San Isidro and visit the old quarter before we head towards Tigre city, where we will sail along the Delta of the Paraná river, made of thousands of islands and small rivers and surrounded by thick vegetation. We will embark on our delta cruise and float past stilted homes and learn how delta-dwellers access goods and services through a network of floating markets. See landmarks that line the waterways in the relaxed town of Tigre, including historic homes and museums. Tonight we celebrate the New Year like a local Argentinian, with dinner at a local restaurant and fireworks at Puerto Madero. Vacation Day 5: Buenos Aires - Happy New Years! After staying out late for our New Year's celebration, today is a day at leisure. Sleep late, very late and then spend the day relaxing, take a long walk along the boulevard or enjoy a stroll in the park. 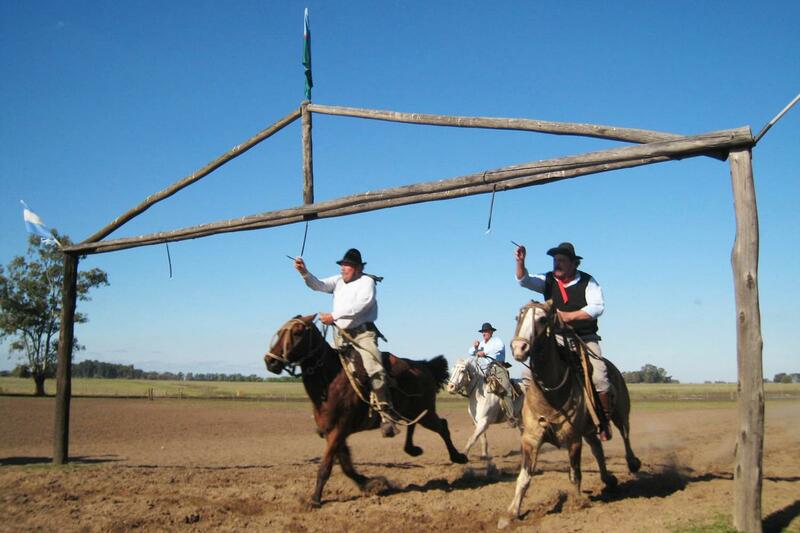 The Pampas (lowlands) are waiting for us to spend a full day at one of the many gaucho ranches. Escape the bustling streets of the city and discover the traditional way of life in the Argentine countryside. Meet the friendly gauchos, talented wranglers and horsemen similar to cowboys of the American West. Climb astride a horse from the ranch stables for a ride through the surrounding farmland. At midday we will have a delicious traditional Creole lunch from the grill and enjoy a folkloric demonstration with singing and dancing. Our day also includes gaucho ring racing, carriage rides on the farmland and a snack with homemade cakes. During the afternoon you can take a guided tour of the house and a typical grocery store of the last century. You can purchase of homemade farm products before we head back to Buenos Aires. Don't forget your passport as we are going to spend the day in another country, Uruguay. Enjoy a 25 mile high-speed ferry ride across the Rio de la Plata, the widest river in the world, to Colonia del Sacramento, or simply Colonia. This lively colonial town, the oldest in Uruguay is famed for its historic quarter, where the jumbled, sprawling streets and mix of architecture represents two centuries’ worth of Spanish, Portuguese and Uruguayan history. To help take us back in time, there are a number of old cars everywhere from the beginning of last century to the glorious 1960’s – some are there just for decoration, others are in full use. Walk the cobblestone streets of the historic quarter with our guide and learn about the town’s rich colonial past. 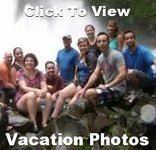 After the walking tour we will have free time in Colonia to spend at our leisure. The best way to explore is to stroll the streets, stopping at a souvenir shop, a small museum or one of the many cafes and restaurants along the way. About an hour's drive from Buenos Aires is the famous Argentina "Cheese Route". Along this gourmet circuit we will stop at local farms, each with their own personality and different kinds of cheese. From hard or soft pastes, spreads or grated, sliced ​​or in portions, of cow, goat, sheep or buffalo, alone or combined with other flavors or products, the route has it all - including wild-pig cheese! Learn about the processes of artisan and industrial processing of cheeses, animal husbandry and extraction of raw materials. On the way back, we will stop at Lujan, a small riverside town, famous for its Neogothic cathedral. The twin towers of the basilica stand 348 feet tall, a landmark that can be spotted from significant distance. Grab that last minute souvenir as the avenue around the basilica is full of crafts shops! Tonight enjoy a splendid farewell dinner and tango show. See a top-quality show with professional tango singers and dancers, in one of the most exclusive atmospheres of Buenos Aires´ nightlife. Our tour ends after breakfast. If you are not joining us on our Around South America Cruise, you will be transferred to the Buenos Aires airport according to your flight schedules. Say goodbye to all your new friends and the end of another singles vacation. Visit one of the newest Wonders of the World and admire the largest Waterfalls in the world up close. 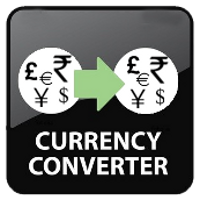 Upon arrival in Puerto Iguazu Airport (IGR) Argentina, you will be met at the airport and transferred to group's hotel. Tonight meet your tour leader and fellow travelers at our meet and greet and optional dinner. The views are amazing on our full day tour of Iguazu Waterfalls on the Argentina side. The 200,000 year old falls span across the border of three countries and is known to pour over 400,000 gallons of water per second onto the rocks below! 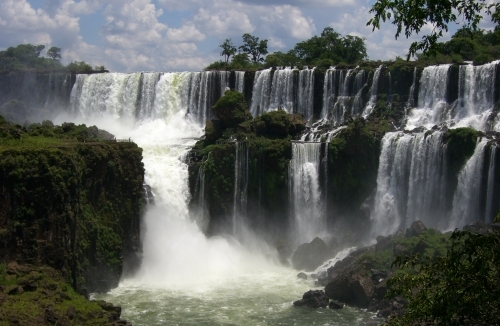 Today we explore three tiers of Iguazu to see the falls from different vantage points. The lower walk leads to the base of the falls where the intense crash of the falls releases a thick mist into the air. The upper path leads to incredible panoramic views of the falls. After our walk, we take a short ride on a train to the footbridge over Devil's Throat, the largest of about 275 waterfalls making up Iguazu Falls. and the border between Brazil and Argentina. The feeling of the magnitude and strength of the water falling is overwhelming and marvel as the water rushes down into the river below and creates clouds of mist and endless rainbows. 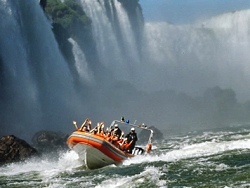 Get your cameras ready because a memorable experience awaits, as we take the Iguazu Great Adventure. We start by entering the jungle by specialty truck and during our three mile ride our guide introduces us to the local nature. Then we board our boat to sail the Lower Iguazu River heading towards the waterfall and enjoying plentiful rapids on the way. 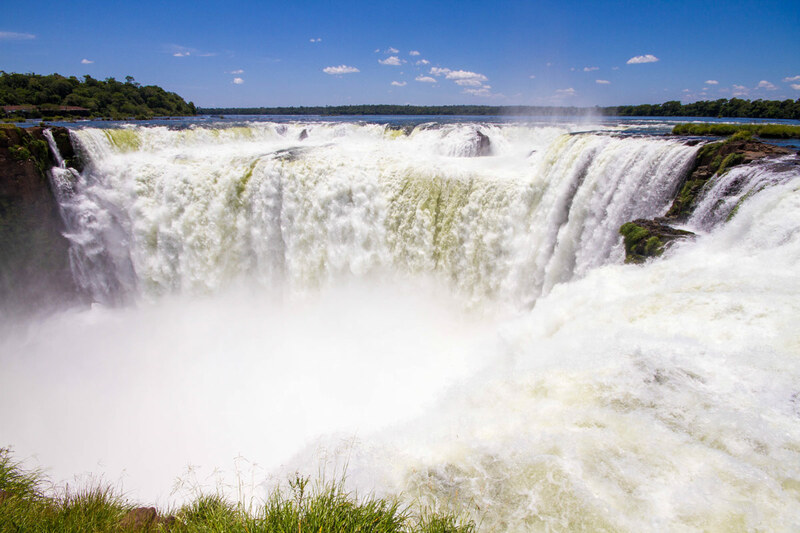 Upon reaching the Tres Mosqueteros Fall, view both the Argentine and Brazilian Falls crowned by the view Devil’s Throat. Then the most exciting point comes when facing the incomparable San Martín waterfall, the second in size and the biggest any boat may face. At the end of the adventure we transfer to the airport. This afternoon fly (flight not included - please check for time before booking) from Puerto Iguazu Airport (IGR) to Buenos Aires, where we will be met at the airport and transferred to the group's hotel.